Craig Smith (right, with Elise Stone) is the Hitler figure Arturo Ui in Bertolt Brecht’s The Resistible Rise of Arturo Ui. Top: Desmond Confoy (center) and Jim Sterling. Photos by Gerry Goodstein. The play is a highly detailed and complex allegory centering on the Al Capone-like figure of Arturo Ui, an American gangster type, straight out of the wildly popular gangster films of the 1920s and ’30s, as are the rest of his mobster cohort. But the protagonist, Ui, is also Brecht’s stand-in for Hitler, with scenes of the rise of Ui paralleling the rise—scene by detailed scene—of Hitler. Ui, however, is not a dashing, brilliant, talented and handsome sort of gangster. And that is the point and source of the scorching comedic farce of the play! To the contrary, as beautifully directed by Kevin Confoy and acted by Craig Smith, Ui is rather a schlemiel, who through happenstance, the weaknesses of those around him, and also because of the systemic forces of capitalist greed and corruption, is able to win control over the Chicago vegetable trade. A key character in the story is the doddering and elderly Dogsborough. Well-meaning, but also seduced by flattery and the opportunity to make a good investment, Dogsborough agrees to become the head of the Cauliflower Trust, an association of grocers that has hit upon hard times. He also agrees to provide the association, inappropriately, with a loan from the city. His initial small corruption, when discovered by Arturo Ui, begins the cycle of extortion and terror that will consolidate Ui’s power. Portrayed with great nuance by John Lenartz, Dogsborough is the cartoon equivalent of German President Paul von Hindenburg who, though he initially resisted Hitler, eventually succumbed and facilitated Hitler’s power grab. Brecht thus counterpoints the comedic story of Ui, brilliantly acted in the Brechtian style by Craig Smith (the artistic director of the Phoenix Ensemble, which is presenting the play), with the historical rise of Hitler, projected as video background. Andrew Lazarow, the video designer, and the production team use labeled scenes of Hitler’s rise to power to create intricate analogies between the outrageous farce in the foreground and the drums of history beating in the background. Sergio Fuezalida (left?) and ZJosh Tyson play gangsters in Bertolt Brecht's allegorical play. Thus a scene involving the discovery and doctoring of Dogsborough’s will has a counterpart around questions of von Hindenburg’s will. At another point, the kangaroo trial and frame-up of an innocent character, Fish, for setting a Chicago warehouse on fire is analogous to the Reichstag fire of February 1933, for which the Dutch communist Marinus van der Lubbe was sentenced to death. Ui’s sidekicks, Giri, Roma, and Givola, are comic-book mob equivalents of, respectively, the historical figures of Hermann Göring, SA Chief Ernst Röhm, and Goebbels. The point of the play is thus the tango of these two elements: the silly and entertaining gangster story in the foreground with the historical parallel in video in the background. Comedy is a means of comment upon the true subject, the historical Hitler. Does it all work? Uniquely, in the Brecht canon, The Resistible Rise employs two complicated and parallel plots. Can this be done without losing the audience? Although there are scenes that hit the mark—driving home the horror and its petty roots at the same time­—the play is far too difficult to follow, especially the story of the Cauliflower Association and its financial goings-on. Good editing to simplify but also to shorten the play would go a long way in this case. Finally, does Brecht’s strategy work? Can the writer use the farce and satire of his gangster story to deflate Hitler without a loss of the gravitas that this segment of history demands? In the year the play was written, Hitler consolidated his conquest of Europe and embarked upon his invasion of the Soviet Union while Ernst Rommel was marching across Africa. The crematoria of Auschwitz roared into action. By 1945, 70 million to 85 million people had died as a result of the war. Brecht’s play falls flat before the weight of this history. 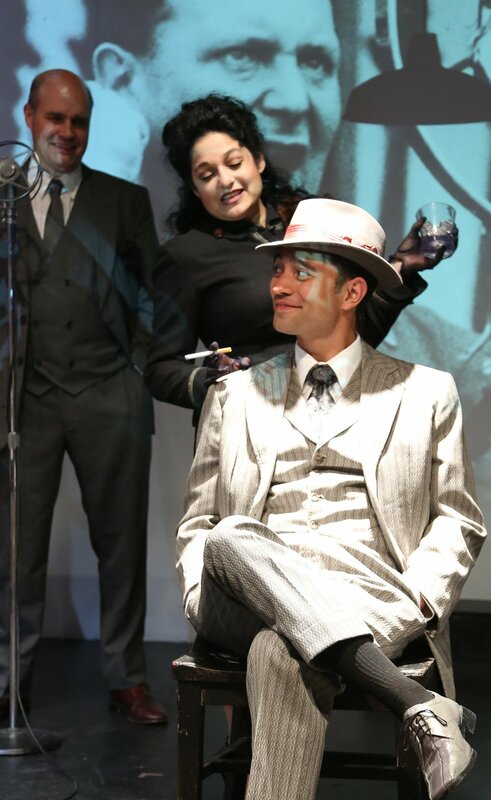 Bertolt Brecht’s The Resistible Rise of Arturo Ui is playing through Nov. 13 at The Wild Project (195 East 3rd St.). Evening performances are at 8 p.m. Wednesday through Saturday, with an additional performance on Nov. 1; matinees are at 2 p.m. Nov. 5, and at 3 p.m. Nov. 6 and 13. Tickets at $25 are available by calling Ovationtix at (866) 811-4111 or visiting phoenixtheatreensemble.org.